I passed first time with Dave! 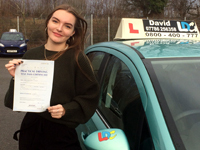 I had little previous driving experience and considered myself as a nervous learner, however I quickly became confident and at ease about learning to drive thanks to Dave. Dave is a fantastic instructor and I would recommend him to anyone wanting to learn, he is extremely patient and understanding, seeing the whole driving experience from a learners perspective. He is also always ready to give clear guidance on how to improve. He has me the confidence to drive independently, and I can't thank him enough for helping me pass. 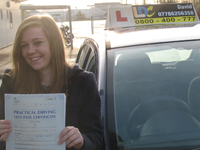 Dave's a great driving instructor: I passed my practical test first time thanks to him and cannot recommend him enough. Dave is very knowledgeable, teaches you well and in a manner he adapts to your learning style, and has incredible patience and good humour ! Lessens are well structured, and Dave is flexible and confident n his teaching approach, allowing you to learn proactively,and to chose areas you wish to focus on and practice as your lessons progress. The car you learn in is excellent. He is also good company on lessons, kind, supportive, and reassuring he built my confidence and had real faith in me as a driver. I took a semi-intensive with Dave, sending him my busy work rota from which he worked out and agreed a lesson time table and booked a practical test for me as the end point for us to aim for. This worked perfectly and was really cost effective :I'd very much recommend a semi-intensive course with Dave. Dave is very flexible and goes out of his way to fit lessons in and make them work for you :he was fair and understanding when i needed to rearrange a lesson,for instance. 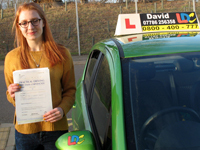 Learning to drive with David was an enjoyable experience because the lessons where tailored to improve on the areas i needed to work on, David is a friendly instructor and is very patient no matter how many silly mistakes i made. The lessons where well structured and everything was explained thoroughly so i understood the theory of each maneuver and skill before practicing it. I would defiantly recommend learning to drive with David because each lesson improved my skills while still being relaxed and fun. 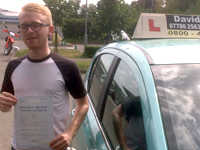 Dave is a absolutely brilliant instructor and I would recommend him to anyone looking for one. He is very calm and explains everything really well. Even though I would make the same mistake multiple times,he would always just explain it again,patiently,until I eventually did it right. Dave had a great way of giving me confidence when I got nervous or hesitant and would always keep a calm tone. He's a great instructor and a great guy,and he makes driving seem so easy. 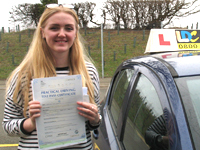 My first ever experience of driving was when I began lessons with Dave, and he introduced me to the world of driving with lots of support and guidance, which meant I soon built up confidence and driving knowledge. Dave was always very versatile in terms of driving lesson dates/times and pick up and drop off locations,with him regularly traveling up to my college so we would have more time to experience city driving without the travelling time which would have eaten into lesson time. The whole process of learning to drive was a enjoyable and rewarding one, with Dave letting me know when I was carrying out a Manoeuvre particularly well and when my driving was showing signs of improvement, as well as taking the time and care to talk to me through each skill however many times I required in order to master each one in good time before my test. At the end of each lesson,Dave would take time to go through what I had done well in addition to what areas we needed to work on as well as asking for my advice so that I tailor my lessons to where I felt I needed to improve to get the most out of my lessons. 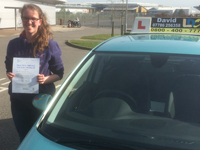 My learning was definitely helped by the positive and friendly environment that Dave provides with his cheery and supportive manner,which was one of the many reasons I chose Dave to teach me how to drive after he taught my sister two years before. Thank you Dave for such a wonderful experience that I will cherish and fondly remember for years to come,and for helping me achieve the independence and sense of pride that driving brings. Passed first time with David. Learning to drive with David was fun and enjoyable Each lesson was planned out at the start so I knew what we was doing.David is a calm and patient guy who was happy to go through things multiple times until I was confident in doing them. I would recommend David to anyone who was thinking about doing their lessons. 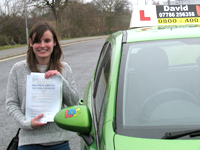 David was A excellent driving instructor who demonstrated a lot of patience and was very flexible to my working hours. 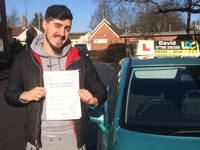 I would definitely recommend David to family and friends and being someone who had done previous driving courses, I definitely think weekly lessons helped me more. David as a great help in aiding me to pass my driving test first time. 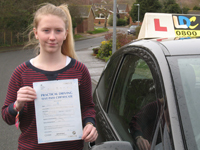 All the basics of learning to drive are covered by him as well as all the manoeuvre's in great detail. He is patient and talks you through your errors in a professional and friendly manner so you are able to learn from them and improve your driving. The general chats I had with David added to the experience and boosted my confidence. IT department could you please put this on my face book page thank you. Learning with David was a pleasure from day one. His calm and patient demeanor always shines through and because of this I never felt patronized or condescended no matter how silly my mistakes were or how many times I made the same one. David, aside from being a great instructor, is very easy to get on with on a personal level and it is evident that passing your test means as much to him as it does to you.I would have no problems with recommending David,especially if you are not confident in your ability or have had issues with other instructors.His patient and calm nature make it impossible not to get along with him. 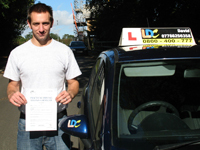 When I first started driving I was a little anxious but I need not have worried as Dave is a calm and reassuring teacher who works to build your confidence. Lesson plans are well structured and he goes over things in great detail. He never rushes you at any time and if you are unsure about something he will happily go through it again until you are confident with what you are doing. Learning to drive with Dave was a great experience and thanks to him I passed first time. 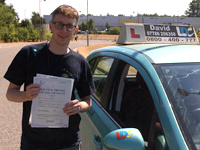 David is a brilliant instructor, he always made me feel very calmed and relaxed about driving and always helped me when I needed it. He got me out of bad habits and made me aware of how i am driving all while helping me become a better and safer driver. I can't recommend him enough for his style of tuition where he explains things to make them clear and simple and always pointing out what I done well or what I need to work on to improve which he would help structure that into the lesson to make my driving even better. Whether you're a beginner, had a few lessons or just need a refresh I know David can help whatever level you're at. Thank you David for your brilliant tuition I couldn't of passed without you. Learning to drive with David was a pleasure. Each lesson was very well structured and thought out. He is a very calm person which helped boost my confidence a lot. He covered everything from the fundamentals to the complex stuff and made sure I understood it all.I feel he didn't just prepare me for me for my test but gave me the sills to drive safely after. The car itself is nice to drive and is made even better with the laughs and general chat David offers. Even when I did make a mistake I wasn't made to feel like a idiot and was simply asked "how could we do that better next time"I couldn't of done it all first time without him and I would highly recommend him to anyone. I passed first time with Dave and would definitely recommend him to others. 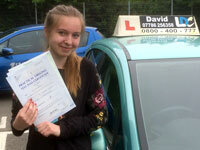 All lessons were very well structured, relaxed and gave me a lot of confidence going into the test itself. Also the car you learn in is fantastic and very easy to drive. As somebody who was always anxious about driving and never knew whether it was something I would ever do, it was a great leap to start my lessons. From the first day, until the last lesson with David, he was supportive,calm,reassuring and a great teacher. 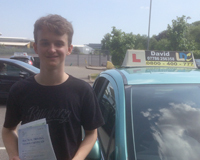 David went through absolutely everything with me, from the simplest detail to the more complex.I always felt comfortable and am now a confident driver who passed first time. I would highly recommend David as a teacher, you won't regret it. It has been a thoroughly enjoyable experience learning to drive with David. He was extremely patient and encouraging in helping me to lean to drive at a pace that suited me best. David was very flexible in re-arranging lessons when i had work or other commitments. 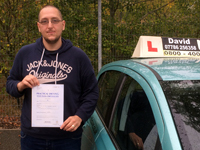 With David I have steadily grown in confidence and feel that David has not only equipped me with the skills necessary to pass my test, but also with the skills to drive safely after my test. 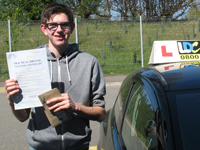 I think it is a testament to David's ability as a instructor that I passed my test with only four minors by learning to drive entirely with David and no private practice. David is a extremely professional. His helpful,calm and patient attitude allowed for me to constantly better my driving skills. 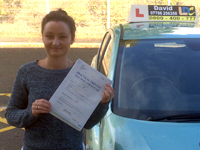 All lessons are thoroughly enjoyable and I would recommend David to anyone that is starting to learn how to drive. The best feature of learning to drive with David is his calm nature,If I ever became nervous or was uncertain, I would be reassured immediately-and over time this lessened my self -doubt. A subtlety in David's teaching technique is the use of 'we' rather than 'you'. For example 'Why have we chosen to use the right hand lane?' one I heard (a lot! ), I didn't notice this at first but this made driving feel a little less daunting and more like a team effort, A reminder that I wasn't alone at the wheel. Another little quirk I enjoyed was his asking 'How could we have done that better' rather than directly pointing out the mistakes. David never made me feel stupid when I made a mistake, which has done wonders for my confidence along the way. On the whole I can recommend David as a professional and friendly driving instructor, with guaranteed laughs along the way. I couldn't have asked for a better instructor. I personally fund driving a bit of a struggle. However David was so helpful and reassuring during all my driving lessons. David was very calm,supportive and patient with me. I passed my driving test first time too! I would highly recommend to learn to drive with David. I found him a really great instructor. 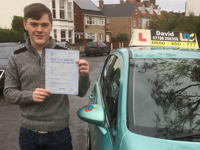 Being quite a nervous driver to begin with, David was always very patient and understanding. Everything was made clear and easy to understand also. I enjoyed seeing the progress I was making with each weekly lesson and found the LDC learning book very useful. I would recommend David to anyone considering learning to drive. Learning to drive with David was very enjoyable from start to finish. He was reassuring when I struggled, and provided me with the necessary adjustments for every mistake I made. Not only was David a great instructor, but he was also a great person in general and I thoroughly enjoyed learning with him. 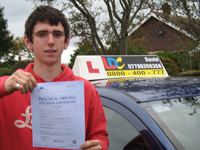 David was a brilliant driving instructor, I passed my test with only 4 minors. David was calm and collected. He would always go over anything that I struggled with. I wasn't confident on the road to start with but that soon changed as David helped me a lot, he was very friendly and patient with me and now I feel a lot more confident. He proved to be very effective. I would highly recommend him. 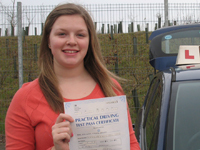 Today, I had my driving test and passed first time with only three minors. This would never have been possible if it was not for David's constant constructive criticism on any mistakes, significant as well as less significant ones, that I might have done. David always explains how things should be done correctly, however many times he has to repeat himself, until I eventually began hearing the statements (in his voice) in my head, during my test haha! I never felt anxious during my lessons, even if I were to find my self in a difficult situation on the road, because he always seemed relaxed which consequently also calmed me down. The down-side of passing the test however, is that I am going to miss having lessons with David and the times we had a laugh. 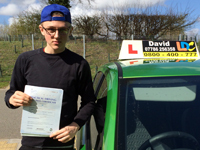 I have and will keep recommending David to everyone who is looking to learn how to drive, properly and professionally. I really cannot express my gratitude enough but I wish him all the best! Thank you! 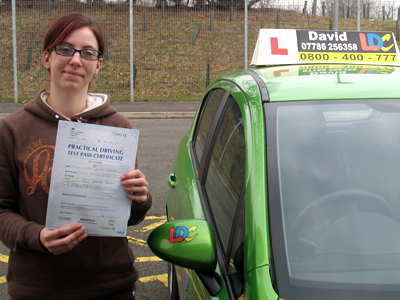 Dave was recommended to my by a friend after my first driving instructor stopped teaching. He's calm and patient even when things go wrong or you get frustrated with yourself. A great confidence giver who explains things clearly and thoroughly. Highly recommend Dave Siggins and LDC, a great instructor and system of teaching. No confidence? No sense of direction? Think you cant learn to drive? Look no further than booking your lessons with Dave. He is calm, reassuring, never minds explaining something over and over again until your confident you can get it right. He goes out of his way to offer support, even after my course and passing( first time) he still told me to give him a call if I ever needed any driving advice , now or in the future. I never thought it would be possible for me to pass my test as nerves and lack of confidence has held me back in the past. Thanks to Dave I have the skills to be a good, but most importantly, a safe driver. My first driving lessons was a crash course with someone else and the experience I had there was terrible. My instructor kept disappearing so I had different instructors with different vehicles also they were never supportive, calm or patient, which put me off learning to drive for a few years. Then, one of my friends started driving lessons and he told me about David. I liked what he offered, the different type of driving lessons and he was always trying to work around my timetable. Instead of telling you what you have done wrong, he asks you what you think you could have done to improve which is, personally, a much better way of learning as he gets you to think. David works his lessons around you by making sure you're ready for the next task while also gently pushing you to move forward. 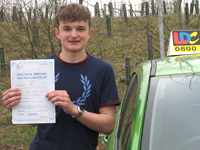 It took me a bit longer than others but he was never impatient, and eventually we booked my practical test and I had passed first time with only four minors. It's definitely one of my best achievements. I would definitely recommend David Siggins, he's very helpful, friendly and patient. Thank you David!! Dave was recommended to me by a work colleague. 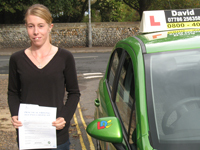 I was very nervous, especially for my first few lessons, and Dave instilled confidence in me with his calm and reassuring manner. He was also very patient, explaining things very clearly to me, breaking down and repeating manoeuvres if I found them difficult. Thank you so much Dave. I will definitely be recommending you to my friends! I passed my driving test first time with Dave. He was so easy to get a long with and made me feel at ease in the driving seat from day one. Everything we did he broke down and made sure I was comfortable with what I was doing before having a go at it. His flexibility was absolutely excellent as he worked around the days and times I could do. He has given me the driving knowledge so I feel comfortable to be on my own on the roads. All I can say is thank you so much Dave and I would truly recommend him to anyone wanting to learn to drive!! Passed 1st time thanks to david, very patient and easy to learn with would recommend to anyone. I started learning to drive with Dave and immediately felt at ease and comfortable in the car. Dave is very patient and calm which helped when I first started driving and also easy to get along with. 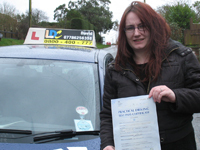 The LDC workbook and DVD helped greatly when I was a learner driver, and if I am ever unsure of something I can always look back to refresh my memory. His flexibility with my schedule was very helpful to me as I have college 5 days a week so he could work around my priorities, Dave helped me pass my driving test 1st time in just under 2 months, doing the semi-intensive course, thank you very much for being such a great instructor and for all your help and support. If you are looking for a patient and reassuring instructor then Dave is definitely the right person for you. 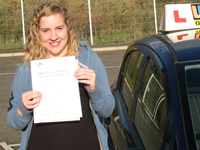 Although I did not arrange my driving lessons myself I am very pleased that I did them with Dave. He is patient and calm even when you are aggravated at the situation you may have got yourself in (which I seemed to do on many occasions to begin with). He was always encouraging and reassuring when I had queries about certain things, e.g my test/ certain manoeuvres etc, answering all of my questions how ever stupid they may of sounded. Dave managed to work with my schedule as I am often very busy and offer lessons on certain days where he normally wouldn't - such as weekends. The study plan that I worked to was very beneficial as I would know when my lessons were in advance and be prepared for them by following the work book and DVD. If you are looking for an instructor who is encouraging, patient and supportive, Dave is defiantly the right instructor. He ensures that you are not only prepared for your test but also for individual driving after you have passed which means safety and care for him is key as we worked towards becoming a better driver, not just being able to pass the test. 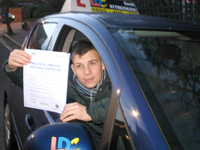 Dave is very easy to get on with and although I sometimes found things difficult he helped the best he could resulting in me passing first time. If I was to choose my instructor I would defiantly choose to 'Drive with Dave'. David was such an amazing driving instructor and I couldn't have passed without him, especially first time! He went at a pace designed towards me and didn't mind going over anything I needed. He was always kind and patient, no matter how many times I messed up. I would recommend him to anyone who wants to learn how to drive. Thank you David! Well what can I say? David is a brilliant guy and I have learnt a lot off him. He's very patient and always willing to explain everything, he's relaxed, calm and very friendly. I past first time with him and I would completely recommend him to anyone! Thank you! I have just passed my driving test first time with David Siggins. He was very patient and understanding and very easy to get along with. 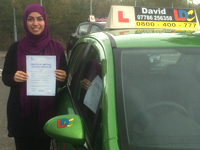 When i had my first driving lesson I was very nervous but David made me feel confident with being on the road. He explained everything clearly and would go over things as many times as needed. I would highly recommend David as a driving instructor. 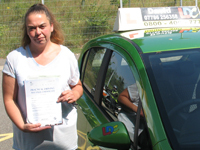 I picked David Siggins from LDC as my driving instructor, I wasn't very confident when I started learning to drive but David kept very calm and helped me as much as he could, which made me much more confident. I got given a DVD with all the imformation about theory tests as well as practical tests, so that helped a lot too! 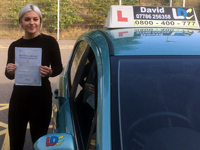 I would definitely recommend learning to drive with David, lessons were always fun and I could have a laugh with him which helped me relax, it was very flexable and fitted lessons to when I could do them and he was always happy to go through things again if I didnt get them. I am so happy that I picked David as my instructor!! I have just passed my test using the LDC system and my instructor David Siggins. I would like to express my gratitude to David who left nothing to be desired and was a top notch instructor. 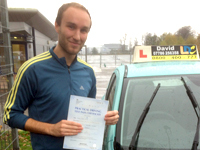 David was calm, punctual, flexible, patient, understanding, thorough, pleasant and above all got the right result (I passed first time). David has a high level of knowledge about the road and driving and made what is a stressful task that bit easier. I have been trying to learn to drive for many years, and with all the help from Dave Siggins successfully passed first time. He explained everything clearly and to a level where you understand. It's the best thing I ever did learning to drive with Dave, the day before my test I was really nervous but Dave calmed my nerves by telling me to treat my test as a lesson with another driving instructor and that was the best thing to calm me. I would recommend him to anyone who wanted to drive . Thanks once again. Throughout my LDC experience I found David to be very patient and effective in his teaching methods. He explained everything thoroughly and in a simple way and under his guidance I was able to overcome nerves and worries as a complete novice behind the wheel. It was easy to get along with him as he created a very friendly atmosphere and it was nice to have an instructor you could have a laugh with while at the same time progressing with the driving lessons well The LDC log book was extremely useful, especially when looking back over previous lessons and my overall progress that I had made. Overall I would definitely recommend David to any person considering learning to drive, particularly if you have never driven before. I will be taken my pass plus with David. I have just completed a semi-intensive driving course with David over a couple of months, I found David to be a very good instructor over the couple of months he has been teaching me, because he wouldn't just let me do a manoeuvre once, he made me keep on doing things until I did them perfectly. Also it didn't feel like I was being pressurised about the driving, the things that I kept on doing wrong he wouldn't tell me off he would keep on just telling me until I got it right. I am very happy with the service and he got me a pass first time with a clean sheet. I have booked a pass plus course with David. 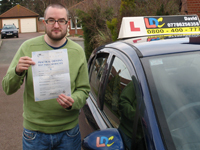 Having failed numerous tests over the years I chose Dave from LDC as my driving instructor. He managed to instill a level of confidence in me that I was lacking under previous instructors, and I can honestly say that at no time did I feel as though I would fail when it came to my test. 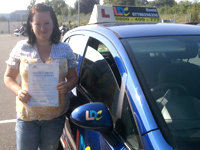 The LDC way of learning to drive is very effective, there is method behind every aspect of what I was taught,and under Dave's guidance everything I needed to do to pass my test became abundantly clear. Not only have I passed,I have also received practical advice about general driving which will serve me well for years to come and help me drive safely. 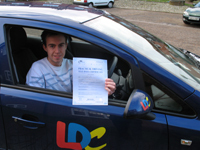 I would wholeheartedly recommend LDC as a driving school, and Dave as an instructor. 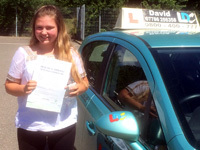 I had lessons with another school but I struggled with certain aspects of my driving but David was very patient and explained every thing very thoroughly. David guided me step by step through all aspects of driving in an easy manner. I found it very easy to get on with David and he helped me to relax before my lessons and the test. After each lesson I could see the progress I was making in the LDC workbook. 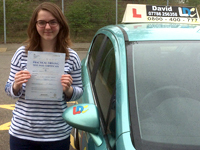 I am happy to have passed my test with David and have my full licence. 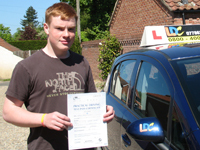 I would recommend anyone thinking of taking driving lessons to go with David's LDC driving school. I got on brilliantly with David who runs the local LDC driving school. He is a fab instructor! I liked the way there was a pupil record form recording all my lessons and the way my instructor covered all my manoeuvres with a simple step by step way. He made them seem really easy. The atmosphere was really friendly but at the same time made good progress with my driving and was well worth the money paid. Throughout my lessons it really felt I was making real progress and would strongly recommend LDC to anyone starting out as a learner. I really enjoyed learning with David. 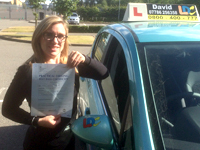 I decided to learn to drive with David after some advice from a friend, I was nervous to begin with but once I started drivingwith DavidI felt very relaxed. David was very helpful and went though things clearly and if you don't understand something he would recap it to you. Also he was very nice to get along with and we usually shared a few jokes with each other. I would thoroughly recommend David to anyone who is wanting to learn to drive. When Looking for a driving instructor I searched for hours until I found the LDC web site. I found the courses offered value for money, My instructor was David Siggins and from the first lesson with David I felt confident that with his tuition I could pass my test. The L.D.C. DVD and work book were brilliant and repeated any thing I had missed or misunderstood in my lessons. I would recommend David to any one of any age looking to get on the road, I have already persuaded my girl friend to learn with David. Now I have passed I feel confident that I will be a safe driver and could deal with any road situation. I decided to go with LDC because it offered its courses at prices i liked compared to other driving schools. I took the semi-intensive course (30 hours) as i wanted to pass fairly quickly. From the very first lesson to the last i enjoyed every moment of it. I was taught by David Siggins, who was very friendly. David's way of teaching was straight forward & easy to understand. 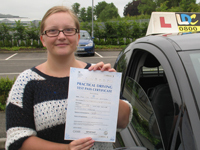 I felt comfortable with the car on my first lesson which made it a joy. The Driving Skills Workbook was very useful with its questions & answers. I recommend reading this. 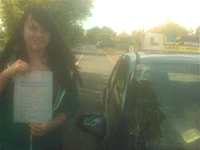 Im pleased to say i passed first time! 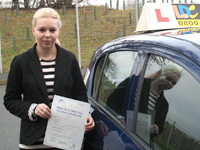 I would happily refer people who want to take driving lessons go with David Siggins LDC. 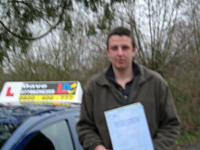 I started my driving with another instructor whom i could not get on with then i started with David Siggins LDC who i found to be very helpful and supportive, calm and understanding David would go over things as many times as needed never in a hurry i would recommend David to anyone considering starting driving lessons.